Marc Newson’s smooth industrial designs have influenced the John Galliano by Bill Gaytten Autumn/Winter 2014-2015 Show. A few Marc Newson’s collaborations : Boucheron (Marc Newson created the « Julia » diamond necklace, which was launched on July 8, 2009), G-Star (Marc Newson has designed the G-Star by Marc Newson Limited Collection, launched on July 15, 2009, which featured 5 jackets for men, and 4 pieces for women), Jaeger-LeCoultre (in 2008, the « Atmos 561 » clock was redesigned by Marc Newson, to celebrate its 80th anniversary), Nike (in the Autumn of 2004, Marc Newson designed the « Z-Doc » sneakers for Nike). 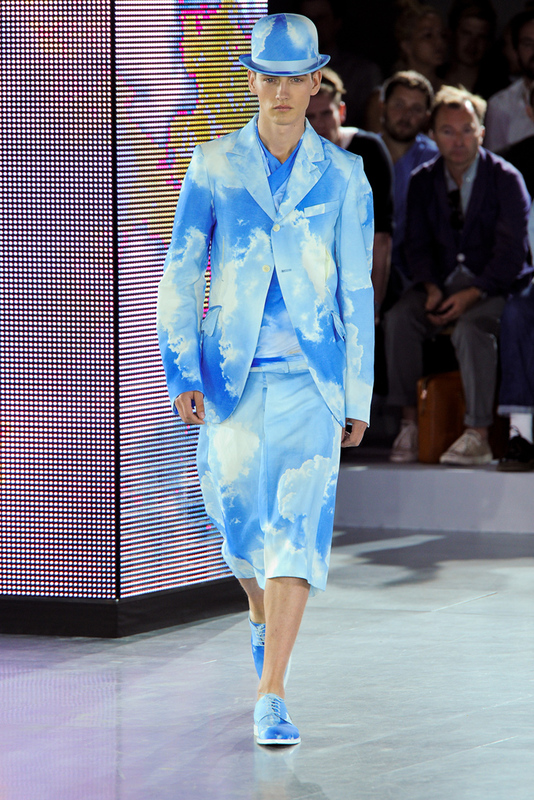 René Magritte’s « clouds » (as seen in his « Empire of Light / L’Empire des Lumières » painting) inspired the John Galliano by Bill Gaytten Spring/Summer 2013 Menswear Show, which was based on surrealism, and which also featured René Magritte-influenced bowler hats. Other René Magritte-influenced collections, campaign or short film : Christopher Esber (the show that he presented on May 1, 2008, as part of 4 Boys, from the Fashion Design Studio at the Sydney Institute of Technology, featured models who had Granny Smith apples in their mouths, which referenced the color green of René Magritte’s « The Son of a Man / Le Fils de l’homme » painting), Diane von Furstenberg Spring/Summer 2012 (the ad campaign for this collection spotlighted, among other surrealist works, art from René Magritte), Jean Paul Gaultier Couture Spring/Summer 2003 (one of the pieces was dubbed « Magritte »), Jean Paul Gaultier Couture Autumn/Winter 2003-2004 (during this surrealism-inspired show, a model was holding a pipe, which was reminiscent of one of René Magritte’s signature), Longchamp Spring/Summer 2009 (the name of this line of bags, « This is an it bag / Ceci est un it bag », was inspired by René Magritte’s « Treachery of Images / La Trahison des images »), Prada Spring/Summer 2010 (the short film, directed by Yang Fudong, for this collection, launched on January 18, 2010 on prada.com, featuring men in suits, who were floating in the sky, evoked René Magritte’s works), Schiaparelli 1938 (« birdcage » bag, inspired by René Magritte’s « Red Model / Modèle rouge » work ; the artist also influenced booties in monkey fur).